Microsoft Access is a software database which still has been used until now. This database is very light, so this is an advantage for it’s user to chose this type of database in order to save the data. Microsoft Access is also come with a lot and usable feature. Starting from creating table, form, queries, report, and even the macros, everything became simple when we want a do it on Microsoft Access, and its typically often that this Microsoft Access is used by everyone to make a database application where the data will be save on its self. We will not discuss a lot about what Microsoft Access can do here. On this time we will try to accessing a database that created using Microsoft Access with our beloved programming language which is Java. Create a database file named Java_MsAccess using Microsoft Access. Field name: CustomerID, type Number (single). Field name: CustomerName, type Text (50). Field name: CustomerAddress, type Text (250). Field name: CustomerPhone, type Text (20). Fill up the table with necessary data. Create a DSN Data source DSN for this database. Create a Java Application for accessing this database using the Data source. For the step 1 until the step 4, we will attach a screen shot only here, because I believe that we can do these steps without written reference here. And for the step 4th, okay for this step we will explain a little bit, so we can understand how to create a data source on windows platform for this database. And then on ODBC Database Administrator window, click Add button and then choose Driver do Microsoft Access (*.mdb), and then click finish button. Choose and initialize the driver for this ODBC data source. Create a database connection to this ODBC data source. Create a Statement for the SQL Queries. Let’s discuss line per line the above code. The first variable is a driver name that we will use it later to accessing ODBC data source, while the second variable is an url of the data source that we would like to access, just remember this data source name have to equals with the data source that we have created before which is: JavaMsAccess. And then let’s take a look the codes inside the main method. The first line on this main method is a line where we define a SQL query which we will use to access these Microsoft Access database. And then we create a try-catch block, this block is the block which all main process of the accessing process is happen. First in this block we initialize the driver that we have defined in the header of the program. And then we create a database connection and the print out the result of it’s connection. The continuous steps are, create a statement, then execute the SQL Statement using the SQL query that we have defined before. And the print out the result by loops the rs variable, which these ResultSet variable values had filled up before. And then we add some catch statement to prevent error appear on runtime, and this catch is also can be use to trace the problem when error occured that can make our application cannot run properly. That’s it, that’s all our try out has finished. Please try and modify for your own need and your own desire. On December 26th 2008, I bought a external hard-drive, Maxtor One Touch 4 Mini with 160 GB capacity and it cost about 750.000 IDR. At the first time I use this external hard-drive I was very disappointed, I cannot use this external hard-drive at all. When I plugged in USB device to my laptop, my Windows XP cannot recognize this new hardware. At first time, I suspected this Windows XP cannot recognize this hardware, then I switch my operating system into Linux Open Suse, the other operating system that I‘ve been choose for my own computer, but the fact, I got one more disappointed feel, this Open Suse also cannot recognize this new hardware. Well I think there’s nothing wrong with my laptop or the operating system. It must be this external hard-drive got some error when it comes out from its vendor. Anything broken maybe or I don’t know, obviously this is about this external hard-drive and its not about my chosen operating system, so I decide to returning back to the shop where this external hard-drive have been bought by me. At the shop, this hard-drive checked by the technician of the shop. And the result of this checking is make feel better, indeed this external hard-drive had something broken that can make it can be used. Then the shop replaces this external hard-drive with the other new external hard-drive that was still same type and same capacity with the broken one. Before I took home this new external hard-drive, the technician makes sure that this new hardware is on good condition by trying first by him self. Indeed this one is on good condition and ready to use, so I agreed to take it home with me as a replacement of the broken one. At home, I started to use this hard-drive to save the data which is very important to me. Because, indeed, I bought this external hard-drive in order to backing up all the important data. Backing up the data became a part of my computer activity. Actually, I want to split this external hard-drive into two partitions, but I can only do that 2 days after, because I didn’t have a software on my laptop that have an ability to split the partition of this external hard-drive. Well as a customer I thought, I want to know the quality of the stuff that I bought rite? So I planned to do some test on this external hard-drive. My first simple test is copying the large size of files from my laptop into this external hard-drive. So I try to test it by copying a file that have 500 MB of its size with one single copy and one single paste, the result is not bad, this new external hard-drive capable to receive the data directly from a single copy-paste for 500 MB size of files. Actually this test is goes to USB cable, to find out whether this USB cable is capable or not to transferring the 500 MB file size. And then I try to copy-paste a data file that have 1GB of size, and the result is still good, but when I try to copy-paste a data file that have 2GB file size, this hardware is apparently showing its weakness. When the data copying into this external hard-drive, and the progress just reached 45% of copied file, there’s an alert balloon showing up at the bottom-corner of my desktop windows, “Windows Delayed Write Failed” and bla..bla..bla… now I can found out that this external hard-drive was cannot resist for transferring data file that large then 2 GB file size. And then I try to delete the failed copied file, but I feel so disappointed, this failed copied file cannot be deleted, when I try to delete, there’s a windows dialog showed up, telling that this failed copied file cannot be deleted. So I try to delete the file using Dos Console, and it still cannot delete. I try to switch to Linux open suse, and its still same, its still cannot be delete, so I left this failed copied file. I will remove it by formatting this external hard-drive and split its partition into 2 partitions. So this external hard-drive will have clean storage. Two days later, I split this external hard-drive into 2 partitions with same size, each of this partition have 80 GB capacity. And then I try to do above test again, this test was failed the windows still have this windows delayed write failed. And then I format again, and do the splitting once again, and do the test once again, but now I’ll test this external hard-drive using Linux operating system. Its little weird, the result that goes with Linux, found there’s none of this external hard-drive had some error, the copy of 2GB of file size was run properly, there’s no corrupted file found. Hmm, I started to think, maybe there’s a problem with my Windows XP when the 1GB file size or above being copy to the external hard-drive. I tried to find out by browse Microsoft web site on FAQ and Bugs page. And I also search another web site or articles in the internet. By these browsing, I can make some statement that there are problems on the Windows system cache when we copy the data with a large size onto external hard-drive. Even the answer of Microsoft website about this problem focused on the failed of the external hard-drive connector, such as USB cable, etc, I still keep the statement that this is all about Windows XP system cache problem. Then I try to find out once more by browse the internet, the possibility of any one else having same problem like me and how he or she solve the problem. After two days, finally I found a related article, and in these article also written how to solve these problem. Unfortunately, I forgot the link, but the important thing is, this link is not the Microsoft website or this external hard-drive vendor web site, but some one else which have same problem with me. After the installation of this software is successful on my Windows XP, refer to the article I made some changes on my Windows XP system cache, and then I restart my Windows XP and make some test again just like before. The test by copying 2GB file size to the external hard-drive running well, there’s no more Windows Delayed Write Failed, I’m happy. Then I try to copy file that larger then 2GB of file size and its still have no problem at all. After do test by copying 5GB file size onto this external hard-drive and its success, I stop the test, and I think the test is finish. Below are the steps, when I’m using Cacheman5.0 to change my Windows XP system cache in order to solve the Windows Delayed Write Failed problem that happen on my brand new Maxtor One Touch 4 Mini 160 GB. That’s it, Windows system cache setting using Cacheman on my Windows XP, to prevent Windows Delayed Write Failed problem. Akhirnya, saya menemukan kembali arsip tulisan saya yang dulu pernah di muat di Tabloid PC-Plus Edisi 185, 20-26 Juli 2004. Tulisan yang dulu saya maksudkan untuk menggali kreatifitas para Computer Freak ini, secara personal saya sendiri tidak punya kopiannya, sebab saya ingat betul waktu tabloid yang memuat tulisan tsb saya beli, saat itu juga terjadi banjir di rumah saya sehingga semua bukti fisik dari artikel saya itu rusak dan akhirnya musnah entah kemana sebelum saya mampu abadikan. Sedang iseng, sehabis menyantap sarapan pagi ini tanggal 06 November 2008 pukul 9.30, saya ketik String “Mengalihbahasakan Sendiri Windows” dengan tanda kutip lengkap di string tsb pada Google, dan saya kaget ternyata ada 5 link yang termuat di hasil pencarian Google tsb, dan dalam link tsb ternyata ada file fisik yang bisa didownload. Setelah saya buka hasil download tsb ternyata filenya berupa PDF file yang ternyata merupakan hasil scan asli Tabloid tsb. Alhamdulillah akhirnya ketemu kembali Tulisan ini. Meski sudah lama dan mungkin ilmu dalam artikel ini tidak bisa lagi digunakan, yang jelas ini sangat berarti buat saya. Yang telah mengabadikan tulisan saya bahkan dari sumbernya langsung yakni hasil scan Tabloid PC Plus edisi 185, 20-26 July 2004. Jika anda ingin melihat tulisan tsb dalam bentuk aslinya yakni hasil scan Tabloid tsb. Silahkan download disini. Dari sekian banyak yang membaca blog ini, saya dapati lumayan banyak pula teman-teman yang ternyata masih kebingungan bagaimana memulai java untuk menjadi satu bagian dalam kegiatan oprek-mengoprek. Kali ini kita akan coba mencoba menginstall java dalam operating system Windows yang kita miliki. Sebelum kita memulai, ada baiknya kita mengerti dulu Java apa yang ingin kita install dalam komputer kita. Java secara umum dibagi menjadi 2, yaitu JRE dan JDK. JRE merupakan kependekan dari Java Runtime Environment, Java yang satu ini Java dimana kegunaannya adalah untuk menjalankan program Java, tapi bukan untuk membuat program Java. Jadi jika kita ingin mengoprek-oprek java dalam arti memulai belajar programming dengan Java, maka bukan Java ini yang kita pilih, melainkan JDK. Nah, JDK adalah kependekan dari Java Development Kit, JDK inilah yang kita perlukan ketika kita memulai kegiatan programming Java. Karena jika kita selesai membuat program dengan Java, kemudian kita ingin mengetes apakah program yang kita buat jalan atau tidak, maka kita pasti juga akan membutuhkan JRE. Intinya, ketika kita ingin memulai kegiatan programmingJava maka kita akan membutuhkan JRE dan JDK. Untuk tujuan diatas, kita bisa mengunduh/download JRE atau JDK disini, tapi khusus buat anda yang ingin memulai kegiatan programming Java, kita cukup mendownload JDK saja tanpa JRE. Sebab didalam installer JDK sudah ada JRE-nya. Silahkan anda pilih JDK yang anda butuhkan, saya menyarankan untuk memilih JDK 1.5, terserah build berapa saja. Install JDK dengan mengikuti standar instalasi yang ada (tinggal klik next-next doang hi..hi..hi…). Tentukan path instalasi Java sesuai keinginan. Ditengah instalasi JDK akan muncul dengan sendirinya instalasi JRE dan tentukan jugapath instalasi JRE sesuai keinginan. Lakukan setting Environment Variable Java pada system operasi komputer anda. Mari kita jelaskan satu-satu dengan melompati step yang pertama. Install-lah JDK yang sudah anda download tadi dengan cara men-double-click file yang anda download, ikuti semua step instalasinya hingga sampai pada step menentukan path instalasi JDK anda. Disini saya menyarankan supaya kita meletakkan path instalasi JDK pada C:\Java\JDK1.5\ jika belum ada, buatlah. Kemudian ketika mulai menginstall JRE dan sampai pada step menentukan instalasi path, disini saya juga menyarankan supaya instalasi path untuk JRE di letakkan di C:\Java\JRE1.5\ Mengapa demikian…? ya tidak kenapa-kenapa, biar mudah saja mengingatnya. Setelah selesai, sekarang kita akan mulai melakukan setting Environment Variable pada sistem operasi komputer kita. Sebelum memulai ada baiknya kita tahu kenapa kita harus men-setting Environment Variable pada komputer kita? jawabannya adalah agar kita mudah dalam memanggil Java Compiler dalam command prompt. Java Compiler kita perlukan untuk mengkompilasi kode-kode program yang telah kita buat untuk menjadi file-fileclass, sehingga file class tersebut dapat kita eksekusi dengan menggunakan command java (nama Class). Perintah diatas berarti “Tolong setting path menjadi path yang sudah ada ditambah dengan pathnya java yaitu di C:\Java\JDK1.5\bin” kemudian tekan enter setelah itu silahkan anda tes apakah Environment Variable yang Java sudah ter-set dengan mengetikkan perintah C:\java -version. maka setting Environment Variable sudah berhasil kita lakukan. Cara ini kurang efektif sebab setiap anda buka command prompt baru anda harus mensetting kembali Environment Variable tsb. kemudian tekan tombol OK dan tutup semua window yang terbuka, sekarang kita tes kembali apakah Environment Variable Java sudah masuk dalam Sistem Operasi kita dengan cara sama seperti cara mengetes pada nomor 1 yaitu membuka command prompt dan mengetikkan java -version. Akhirnya selesai sudah kita meng-install Java dalam sistem operasi komputer windows kita, sekarang kita bisa memulai kegiatan programming Java, silahkan anda buat program kecil Hello World, kemudian compile program tersebut hingga menjadi file class. kemudian panggil class tsb dengan cara seperti berikut ini : c:\java . untuk source codenya silahkan klik link ini. Pada dasarnya virus adalah sebuah executable program yang berjalan dengan sendirinya atau di-trigger oleh program lainnya, tanpa sepengetahuan kita atau user yang menjalankan komputer. Dalam perkembangannya pembuat virus melindungi virus buatannya dengan menyisipkan perintah-perintah pada tubuh virus tsb yang sifatnya membuat virus tsb seakan-akan kebal. Misal kita sudah tahu dalam flashdisk kita ada sebuah virus dengan nama a.exe, ketika menghapusnya dengan cara mendelete, sebentar kemudian muncul lagi sebuah file yang bernama b.exe, untuk kemudian kita delete lagi virus b.exe tsb, lalu kemudian muncul lagi sebuah file dengan nama c.exe, demikian seterusnya sampai kita lelah sendiri mendelete virus tsb. Jika keadaan demikian sebenarnya bukan a.exe, atau b.exe atau c.exe atau lainnya yg menjadi program utama virus tsb. Ada sebuah program lain yang berjalan dibelakang tanpa kita atau user ketahui diam-diam memeriksa jika a.exe tidak ada maka buatlah b.exe, jika tidak ada juga maka buatlah lagi c.exe dstnya, begitu kasarnya. Inilah yang dinamakan thread dalam istilah programming atau daemon. Kesimpulannya, sebenarnya si pembuat virus akan membuat virusnya jadi sebuah thread atau daemon atau service istilahnya. Pertanyaannya adalah apa yang menjalankan thread atau daemon atau service ini. Seperti yang sama-sama kita ketahui bahwa jika kita memiliki operating system windows XP maka ada beberapa service yang dijalankan ketika windows selesai mem-boot up Operating Systemnya, kita bisa melihat service atau thread apa saja yang dijalankan oleh windows selesai ia mem-boot up mesinnya dengan cara melihat System Configuration pada windows itu sendiri (Klik start -> Run -> ketik msconfig pada kotak yang disediakan lalu tekan enter). Pada System Configuration Utility tsb, tab startup, kita bisa melihat item-item program apa saja yang dijalankan pada saat windows selesai memboot-up mesinnya. Jika virus adalah sebuah thread atau daemon, bagaimana cara menjalankan virus tsb untuk kemudian virus tsb menjadi sebuah thread yang akhirnya dapat menulari komputer kita dengan virus yang ada pada flashdisk tsb?. Untuk menjawab pertanyaan ini, coba perhatikan cd yang bootable entah itu cd-driver, cd-program atau cd lainya yang bootable(masukkan cd nya kemudian cd tsb akan mentrigger sebuah program yang dalam pada cd tsb). Dalam CD tsb pasti ada sebuah file yang bernama autorun.inf, coba buka file ini dengan menggunakan notepad, maka akan kita temukan baris-baris yang memerintahkan Operating System untuk menjalankan suatu file. File autorun.inf pada dasarnya adalah sebuah file yang dikenali akrab oleh windows untuk kemudian mengeksekusi baris demi baris kalimat yang ada pada file tsb dengan beberapa kata yang memang sudah ditentukan seperti OPEN, RUN dan lain-lain. Jadi sebenarnya ketika kita memasang sebuah CD dalam optical drive kita seperti CD-ROM, DVD-ROM dan lain-lain, windows memang akan mencari file autorun.inf tsb. Jika file itu tidak ada maka windows tidak akan melakukan apa-apa, jika ada, windows akan memeriksa baris-baris demi baris untuk kemudian mengeksekusi baris demi baris yang ada pada file tsb. Demikian halnya dengan flashdisk atau media penyimpanan lainnya. Jika windows mendapati ada file tsb, windows akan segera mengeksekusi baris demi baris yang ada dalam file tsb. Namun karena si pembuat virus memang tidak ingin kegiatan programnya(red: Virusnya) diketahui oleh user maka dengan sengaja si pembuat virus mengeset file autorun.inf ini dengan attribut hidden dan read-only. Attribut hidden gunanya agar file ini tidak bisa dilihat oleh kita atau user (kecuali dengan mengeset folder option kita menjadi show hidden files) sementara file read-only berguna untuk membuat file autotun.inf ini tidak bisa di-edit ataupun di-delete. Bagaimana caranya si virus atau si pembuat virus membuat file autorun.inf ini ke dalam flashdisk kita?. Ini adalah salah satu feature(kemampuan) si Virus tsb. Jika anda mau membuat virus, ini adalah kemampuan mutlak yang anda harus miliki supaya virus anda dapat tersebar dengan luas. File autorun.inf yang merasuki flashdisk kita dibuat oleh virus itu sendiri. Bisa anda bayangkan? sebuah virus akan membuat file autorun.inf dalam media penyimpanan yang writeable(dapat ditulisi file) dalam hal ini flash disk. 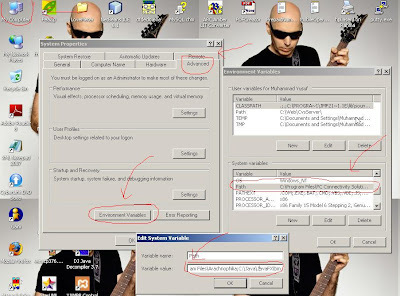 Itu akan menjelaskan kenapa jarang ada virus yang menyebar lewat CD, karena CD adalah media yang tidak mutlak writeable, sebab untuk menulis dalam CD kita harus burning CD tsb dengan menggunakan software burning seperti NERO dan lain-lain atau windows default burning media. Sementara FlashDisk, adalah media yang memang writeable. Selain kemampuan membuat file autorun.inf, biasanya virus juga mempunyai kemampuan untuk men-disable REGISTRY TOOLS (regedit), men-disable folder option, membuat entry dalam System Configuration Utility, mengedit value-value dalam registry windows, dan lain-lain, yang semuanya itu bertujuan seakan-akan membuat virus itu jadi kebal, hilang atau tidak bisa di-delete dengan tujuan utamanya agar virus itu tetap bisa hidup dalam media penyimpanan kita. Kita akan bahas feature-feature virus ini dalam kesempatan yang lain. Kembali ke tema tulisan ini. Jadi intinya ketika kita tidak menancapkan flashdisk kita ke dalam komputer sebenarnya virus ini tidak beraktifitas(thread), dia sedang tidur, virus ini akan bangun dan beraktifitas kembali jika ada yang membangunkan, siapa yang membangunkan ? Ya file autorun.inf tadi, yang pasti akan di eksekusi oleh windows kita ketika kita menancapkan flashdisk kita ke dalam komputer. Sekarang mari kita balik teorinya, jika virus dijalankan lewat autorun.inf dalam flashdisk kita, bagaimana kalo kita dahului si virus tsb, kita buat file autorun.inf dalam flashdisk kita yang masih bersih dan kita setting file tsb dengan attribut hidden dan read-only, sehingga virus atau program lain tidak akan bisa membuat file autorun.inf dalam flashdik kita, karena memang sudah ada file tsb dan memiliki attribut yang read-only(hanya bisa dibaca saja). Masuk akal kan…? Bagaimana isi file autorun.inf yang kita akan kita buat nantinya, silahkan buka notepad anda dan ketik [autorun] saja dalam file tsb. Lalu simpan ke dalam flashdisk anda dengan nama autorun.inf, jangan lupa untuk mengeset Save as type menjadi All files ketika kita hendak menyimpannya ke dalam flashdisk kita. Setelah itu jangan lupa untuk mengeset file autorun.inf yang baru saja kita buat dengan cara klik kanan dan pilih properties pada file tsb, kemudian centang kotak Read-Only dan Hidden pada bagian attribut properties file tsb. Dengan demikian kita sudah mematikan salah satu langkah virus untuk menulari flashdisk kita dengan virusnya. Sebagai tambahan, ketika virus menulari flashdisk kita, biasanya virus cuma akan meng-copy dirinya langsung kedalam flashdisk kita tanpa membuat folder, seandainya flashdisk anda dikenali oleh windows adalah G:\ , maka si virus akan mengkopinya langsung ke dalam G:\ sehingga keberadaan virus itu jadi jelas buat kita. Kemudian virus juga biasanya mempunyai ekstension exe, scr, cmd. Dari sini kita bisa bikin rencana, kita tidak akan membiarkan file dengan ekstension-ekstension tsb mendek dalam flashdisk kita, ketika kita membuka flashdisk kita file tsb harus sudah tidak ada dalam flashdisk kita. Bagaimana caranya ? Penjelasan : perintah ATTRIB akan merubah semua file dengan tiga ekstention tadi jadi tidak Hidden(-H), tidak Read-Only(-R) dan tidak System (-S), sementar perintah del akan menghapus semua file dengan tiga ekstension tadi, ingat perintah del ini akan menghapus semua file dengan akhiran tsb, maka jangan secara sengaja anda meletakkan file ber-ekstension tsb yang memang anda perlukan sama letaknya dengan file run.bat ini, resikonya file anda akan hilang. Simpanlah semua file yang anda perlukan dalam suatu folder yang telah anda buat sebelumnya. simpan kembali file ini, lalu rubah lagi attribut filenya menjadi Read-Only dan Hidden kembali. Secara logika setiap anda akan membuka flashdisk anda, windows akan menjalankan file autorun.inf dimana didalam file autorun.inf tsb akan mengeksekusi file run.bat, dan file run.bat ini akan menghapus semua file yang ada langsung dalam flashdisk anda tanpa folder setelah sebelumnya mengeset attribut semua file dengan akhiran tsb dengan settingan tidak read-only, tidak hidden, dan tidak system. Sehingga tidak akan pernah ada file exe, scr, dan cmd, dalam flasdisk anda. Kekurangan dalam trik ini adalah anda tidak bisa men-double-klick langsung flashdisk anda dalam Explorer My Computer untuk membuka flashdisk anda. Anda harus mengarahkan pointer mouse anda ke address bar windows explorer, baru kemudian membuka flashdisk anda dengan cara meng-klik flashdisk anda yang ada pada address bar tsb. Atau anda mengetik nama flashdisk anda dalam start->run->ketik drive letter flashdisk anda (misal g:\) kemudian tekan enter. Sebab ketika anda double klik maka file run.bat yang dijalankan dan file ini lah yang mencegah anda tidak bisa mendouble-klik flashdisk anda. Atau mungkin anda ingin coba memecahkan kekurangan ini, silahkan saja, semua terbuka buat anda jika anda mau kreatif dan mempunyai jiwa eksplorasi yang tinggi.